7753, 7269: It's no secret - most top designers in any field would concur. The keys to good looks are keeping it simple & highlighting the contours. 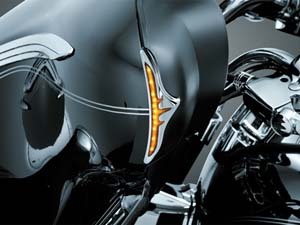 Regardless of the color or finish, chrome goes with anything & these elemental accents will add depth & character to the time-honored Bat-wing fairing. 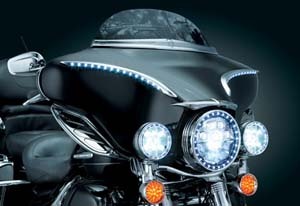 Lighted Fairing Trim require no tools & no drilling. Simply clean the surface, peel, stick & admire! They also surface mount but require drilling to route wiring. Fits '96 to '13 Batwing Fairings. 6904: Similar to above for fits the Project Rushmore 2014 bikes. 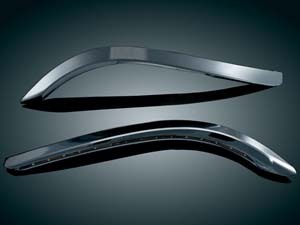 6903: Sleek and streamlined with a brilliant chrome finish, these accents are sure to add distinctive style to your outer fairing. Designed to complement the traditional bat wing shape with their unique Tri-Line feature. Easy peel-and-stick installation. Fits: '14 Electra Glides, Street Glides & Trikes. C3D-LWT: Pierce the night with the C3D-LWT LED Lighted Horizon Windshield Trim. 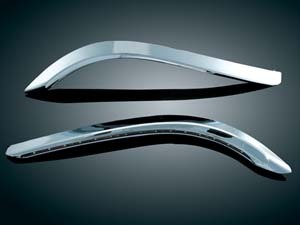 Clean and classy styling flows with the lines of your vented batwing fairing to enhance the look of the front of your motorcycle. 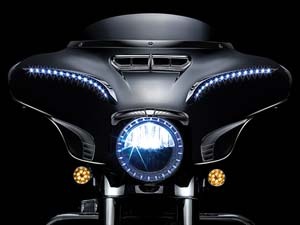 Hidden LEDs illuminate the bottom edge with a bright white running light and amber sequential turn signals to increase visibility. Fits '14 to current H-D Touing Models with Batwing fairing. Chrome. C3D-LWTB: Similar to above but in black. 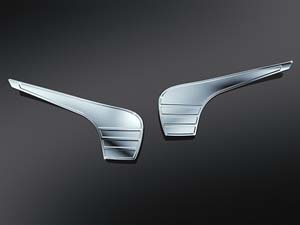 CDWT: Windshield trim w/turn signals. 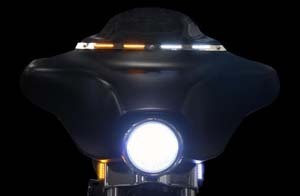 White LEDs will illuminate as daylight running lights but when turn signal is applied, the white LEDs turn off for the entire turn signal cycle, providing greater visibility to the full contrast, amber turn signal LEDs. Fits: All '97 and newer H-D Batwing Fairings. Available in chrome or gloss glack. 100% Plug and Play. Lifetime OEM warranty against LED failure. WTST: Add some flare to your windshield with the latest lighting from eGlideGoodies. 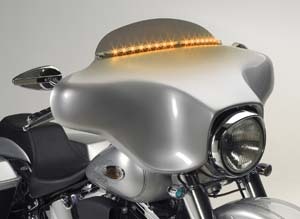 The Windshield Turn Signal Trim is a windshield trim with integrated sequential amber turn signals (16 running LED's). Plugs into stock harness; two holes needed to install. Fits the '96 to '13 H-D Touring platform. Easy installation. WT-24: Run-Turn Edge Accents for Batwing Fairing. A nice subtle touch of chrome & additional lighting to create a unique look. 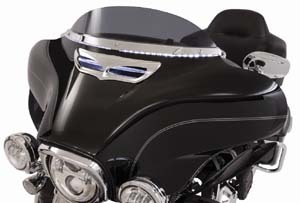 Perfectly contoured to follow the lines of the outer edge on the inner fairing, the addition of auxiliary run & turn lighting make this a must have. Installation requires no drilling or modification to the fairing. Fits '96 to '13 Electra Glides, Street Glides and Trikes.